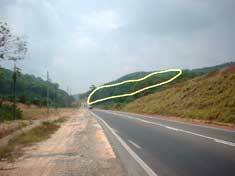 View of the land (bound by the yellow lines) from Raub towards Bentong. 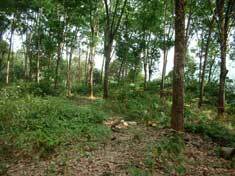 The land is comprise of 5 lots of which 2 lots are fronting the main road. The view from the top of the land should be panoramic. The entrance to the land. The front portion is on a gentle slope as can be seen here. The road winds up the 5 lots in a zigzag pattern. A 4-wheel drive can easily drive on this road. Another view of the land at the front lot. 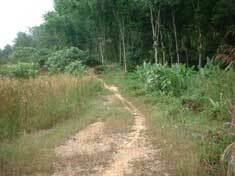 The white background is the neighbour's durian plantation which is on a slope and is lower than this land. 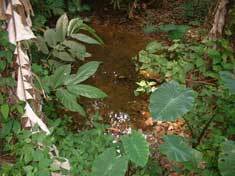 This is one of the three streams where water is still running despite the dry spell now (March 2002).